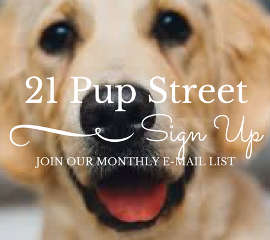 Want to get in on canine celebrations? Here are some tips for commemorating special occasions with your pup, whether it’s a pupversary, birthday or just because. Bakeries aren’t just for people anymore. Now you can get a personalized canine cake, designer pupcakes or doggie donuts at a nearby dog bakery. Three Dog Bakery has a number of locations across the United States, and there are many local dog bakeries nationwide. This year, I bought Daisy a personalized peanut butter heart cake from Three Dog Bakery Albuquerque for just $6.99. There are a ton of recipes online for homemade dog treats. Pick out something with some of your dog’s favorite ingredients (hint: my dogs go crazy for peanut butter and pumpkin treats). Here are some of my favorite dog treat recipes. I’m pretty sure Daisy’s favorite things in the whole world are playing fetch and meeting new human friends. So her perfect day includes a game of ball and going to the doggie store to look for hands to pet her. This year, I brought Daisy to the doggie bakery and she made friends with every single person in the store. It doesn’t matter what your dog’s favorite activity is – let them do it on their special day (unless it’s something unsavory or destructive like eating poop or digging up your garden). Some pet stores offer free treats to your dog on their birthday. Petco offers a free 1-pound bag of goodies from the treat bar during your dog’s birth month. Make sure you’re registered as a Petco Pals member and that you enter your dog’s birth date to receive this offer. Learn more. Your dog is a special member of the family, and you’ll want to cherish these memories for years to come. Make sure you get plenty of photos of your pup on their special day (and every other day)! Tips for taking selfies with your pup. How do you celebrate with your pup? Comment below! Happy 11th Birthday and 10th Gotcha Day, Daisy. We hope you enjoyed a pawsome day of celebrating. The video of your day was so great. Looks like you were able to pick out what you wanted from the bakery. Thanks for sharing your lovely day with us. Have a wonderful upcoming weekend.